What was your lightbulb moment in terms of understanding the importance of supporting other women in the entertainment business? 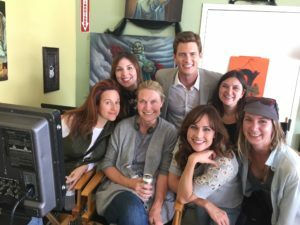 I actually only recently had the lightbulb moment: I was very fortunate to be given a directing job by Sharon Bordas at Mar Vista Entertainment earlier this year, and it amazed me how simple that was with her and how impossible it had been in the past. 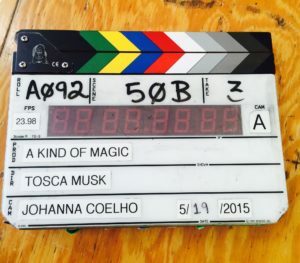 I’ve produced a lot of movies – I’ve made dozens of television movies, features and series – but never actually had the opportunity to direct anything. It’s been something that I’ve wanted to do for 15 years and every time I’d mentioned it to any of the executives or colleagues I was working with, all of whom were male, they said no not yet, maybe in five years, it’s not really appropriate for you, etc. And the second I mentioned it to Sharon, she said great…definitely you’re the one. And it occurred to me shortly after that, of the very few opportunities that are out there to spearhead a movie, they are not being offered to woman. That even when the woman asks for that position and knows that they can do that position, it’s still not offered to her. I realized that if we wanted to increase those opportunities, we had to be like Sharon and offer them to the very capable woman around us. You’re a mother of twins, a boy and a girl. Tell me why it’s important for both of them to grow up equally understanding the importance of gender quality? As a single mother of a boy and girl, it is so important for both of my children to know that both a man and woman can achieve any goal that they strive toward and support each other in their goals. I could never allow them to think that one of them is better than the other one. Or that one of them could achieve something the other could not. Or that one should get paid more for the same job that the other one performs. That’s just ridiculous. Have you found that it’s a challenge to hire women? If so, what do you come up against? I haven’t found it hard to hire women when I’ve found a woman for the job. The difficulties seem to be finding women for the position. Not that there aren’t women out there. But, most of the time the recommendations are men. So I guess that’s what I’ve come up against: when looking to fill positions the recommendations are generally male. Even when you ask if there is a female on the roster there still aren’t many, or any, recommendations. As a woman, what challenges have you experienced in your journey to becoming a director? I think I touched on this earlier on. I found it very hard for people to give me a chance to be a director. Even as the producer and the person that has raised the money and found the project, I have not had a chance given to me. That can go for many reasons though, I often have to sell the director to the investors in order to raise the money and in the past I have found it hard to sell myself as a director. I think it’s actually something that is ingrained in a lot of women growing up: it’s not nice to brag about yourself. But after being given this chance by Sharon I feel completely confident in my ability to direct movies, my love and passion for being a director, and I have absolutely no issue with pitching myself now. I realize that there’s nothing else that I care to do. And that I have to seize the opportunities that surround me. Because I can’t rely on someone just giving me another opportunity to direct. But as a producer, and someone who has been responsible for getting so many films off the ground, I realized that I am the person that can, at the very least, create that opportunity. And I am also fortunate in having as very supportive producing partner, Jina Panebianco, it feels the same way. 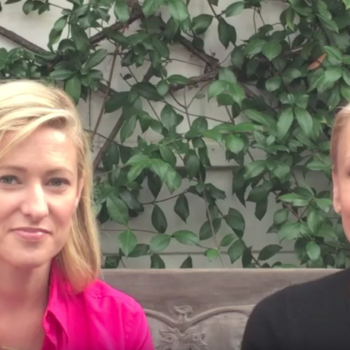 What challenges have you and Jina, your producing partner, faced as producers? The biggest challenge that Jina and I have faced is that executives and investors tend to listen to male counterparts before they listen to us. If there is a production question, if there is a financing question, if there is a budget question, if there is a distribution question, if there’s a talent question, they will always rely on the guys opinion before they will even ask ours. And just to be clear in the positions that Jina and I have held with regards to being producers on movies- we have handled ALL aspects of production. We have raised the financing, worked with tax credits, negotiated with distributors, created the budgets, and we have found and hired talent without the help of any man. Then, we have found that as soon as a male counterpart gives his opinion, the investor or executive tend to lean towards it. I would say that it is starting to change though. At least for Jina and myself. We’ve gone through the ringer as producing partners over the years, but we have always stood by our investors and backed our executives, and we have felt that in return; respect, honesty and integrity go a long way. And tenacity. Just keep going. What can women do to hurt themselves? Women can hurt themselves in this industry by not standing up for themselves. And not saying yes to opportunities. And in not thinking that they are the best for the opportunity. Too often women say no to opportunities because they think they won’t be able to complete the job in a mind blowing way. Men, on the other hand, will take the position and know that they will do a good job. We have to know that we will do good job. We have to say yes to opportunities. We need to create more opportunities. Have a positive attitude. Strive to reach your potential. And don’t let anybody say that you can’t do it. Because I’m pretty sure you can just as well as everybody else in the room. Because if you made it to this room, you are qualified. 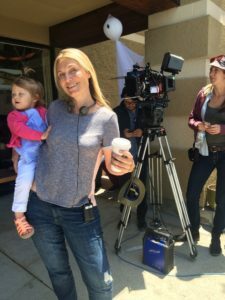 A recent study by Dr. Martha Lauzen, Executive Director of the Center for the Study of Women in Television and Film at San Diego State University, found that women are far more likely to hire women. For example, in the TV world, women comprised 50% of the writers on shows with a female creator. On shows with male creators, women only comprised 15% of writers. So, women hired men & women equally. Men, on the other hand, did not. How do we get men to see the importance of equality in their hiring? I don’t know how we get men to do anything. Ha! But I hope that as times change, men do start to see the importance of equality in hiring. I’ve actually started to notice in a few meetings some of the executives are a little bit more interested in hiring woman. I’m not sure if it’s because of these recent studies that they feel that they’re under the magnifying glass, but I have found that a few more of them than before are more open to females in key positions. And hopefully as we seize these opportunities, inch our way into these key positions, and show that we have every bit of skill and talent to knock the ball out of the park. Then, the conversation will be about who’s best for the job and not what gender are they. You recently produced and directed a movie. Congrats! 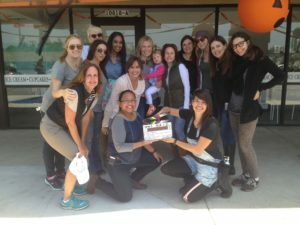 I was one of the leads in your film, and I was very impressed with the amount of women working behind the scenes- writer, producers, director, DP, etc. Why is it important to have that female presence in your projects? Well, once again it’s about creating opportunities. I was very fortunate to be given an opportunity, and it’s important for me to pay it forward. I also really enjoyed working with such a talented group of woman. Not that I have any problem working with men. But, I have found, as a director working with women in the key positions surrounding me, I get more support and less challenges. While it goes against stereotype, women are more rational and supportive onset. While they are very eager to give their opinion and to share their thoughts on something, there’s very little conflict. Not to point out a negative in the male gender, but I found that when I have challenged men on set in the past, they will throw a tantrum. HA! I’ve not had any woman throw tantrums onset before. Not that women don’t throw tantrums, I’ve just not seen it. When and where can we see this movie? It’s called “You Cast a Spell On Me” and you can see it now in the United States: On Demand, iTunes, and Amazon. Then, you can watch it on the Ion Network on October 25th. What can we look forward to next from you and Jina? Jina and I are very excited to be producing a romantic comedy called “Are we dating?” later this year, and next year I look forward to returning to the directors chair again when we make another romantic comedy “A Nice Girl Like You”.